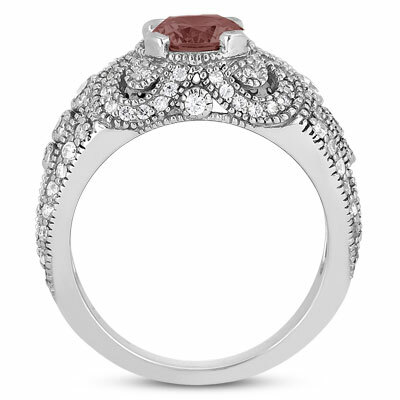 This vintage style garnet and diamond ring in 14K white gold adds a rich burst of crimson glimmer to a design that celebrates the beauty of times past. The 5mm round garnet that serves as the center stone of this sophisticated piece is accented by over 60 round diamonds; these stones, along with fine beaded edges, form a vintage design that's truly extraordinary. This 14K white gold ring is eye-catching and glamorous, perfectly bringing a style from a bygone era into the present. 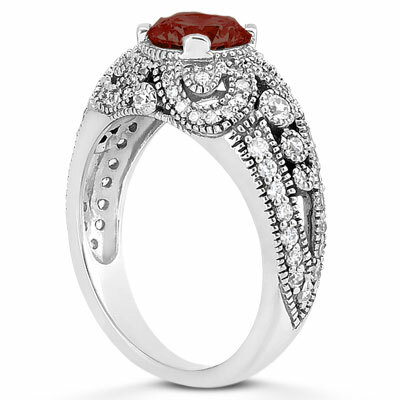 A deep red garnet is surrounded by 64 accent diamond in the vintage 14K white gold setting. Also available in 14K Rose Gold, 14K Yellow Gold or Platinum. 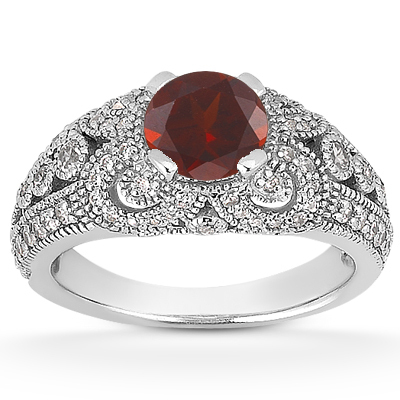 We guarantee our Vintage Style Garnet and Diamond Ring, 14K White Gold to be high quality, authentic jewelry, as described above.